Grand Hyatt Lounge NYC. Directly adjacent to Grand Central Station. Train travel is often associated with romance and air travel (at least nowadays) with hassle. Similarly, hotel airports have a seedy reputation, while a hotel in a train station sounds elegant. My kids and I have stayed at the Crowne Plaza Indianapolis Downtown Union Station, with rooms in an actual train, and recently at the luxurious Grand Hyatt New York, adjacent to Grand Central Station. One of the best features of the hotel for families is the Grand Club, a lounge that offers breakfast, hors d’oeuvres and dessert daily. You can pop in any time for a glass of milk or juice, or a latte from the fancy coffee machine. The self-serve breakfast makes the $100 premium for club access both a luxury and a bargain. There were cold cereals with whole or skim milk, hot cereal, platters of fresh fruit (each on its own so the ‘icky’ fruit didn’t have to touch what your child likes) and a variety of juices. The Grand Hyatt offers plenty of space for a family to stretch out in a suiteAnd there was also local organic yogurt, (plain, non-fat) Greek yogurt and yogurt parfait, bagels, lox and cream cheese, whole grain bread and a toaster, and a couple of local cheeses. You could also indulge a sweet tooth with excellent muffins and croissants. I saw people filling plastic containers for snacks; you could also take a banana or an apple to go. But there is more. The Grand Club has a new outdoor area, filled with comfortable seats, where you can eat in nice weather. 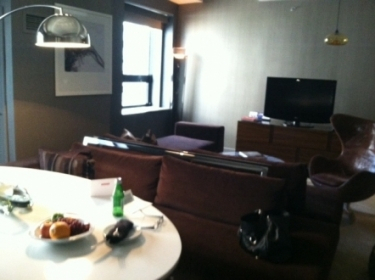 Since the lounge is on the 16th floor, it offers a quiet respite from the city. If you stay in a suite or a club room, your room will also have electronic shades. You can open and close the shades from bed or a wall switch, and the sahdes go all the way down to black out lights in the city that never sleeps. Of course, you will want to explore the city, and the hotel offers easy access to 4 subway lines, plus MetroNorth and Amtrak trains for longer trips. If it’s rainy or cold, you can even spend the days indoors at Grand Central Terminal; no coat or umbrella needed. For American Girl doll fans, the hotel has a package that includes a bed for her doll, a gift card to American Girl Place and milk and cookies. And for all kids, the Grand Hyatt features the healthy children’s menu developed with 12-year-old chef Haile Thomas. Note: the Grand Hyatt provided accommodations for one night so my girls and I could experience the hotel. If you to Hyatt and book this hotel, Traveling Mom will receive a referral fee.